The Certified Entrepreneurial Community® Program has been empowering both rural and up-and-coming communities since 2007. It is a proven model and a pioneering initiative for driving the success of entrepreneurial ecosystems. The program enhances community capacity to streamline the startup process, connect existing assets, grow vibrant existing businesses, attract new innovative ventures into the region, and open the doors for additional market opportunity. Entrepreneurship is a proven economic development strategy to create jobs, encourage economic diversification, and revitalize communities. 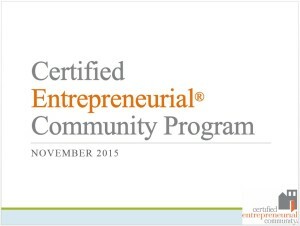 The Certified Entrepreneurial Community® program helps a community develop the resources needed to support new and growing businesses. We help you ensure that every door in the community leads to opportunity. “Earning this certification has brought to light what we need to do, it’s a paradigm shift. It gives us a roadmap and provides guidance all the way,” – Michael McNally, Burke County chamber president. “Achieving this certification was really the culmination of everything we were already doing. It was an affirmation of our mission statement. Now we get to keep it flowing.” – Mark Clasby, Executive Director, Haywood County Economic Development Commission. “We all figured out that if we operate in a silo it just doesn’t work. But when we partner we spur all of us on, and we use all our strengths. The result is more awareness of how we value entrepreneurs and more passion for this in the community.” – Jason Triplett, market president of Wachovia/Wells Fargo. “Since we received CEC certification we’ve talked to many businesses who ask us about it, and when they learn more they are very excited. We are definitely business friendly; we’ve cut back on restrictions and everything is streamlined now. Businesses now see more easily how supportive we are.” – Mayor Carl Bartlett.